A great home remedy against cold! Thanks for sharing! I do often peppermilk now coz of chilled weather...prefect entry.. Perfect entries Sara. Best for cold. Nice one! 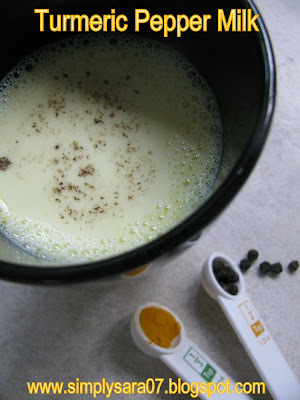 My mom used to make just with milk & turmeric. Adding pepper is a nice Idea. Got to let my mom know about it! Thanks for sharing! i too make this once a week and give for my family.I add palm sugar to it. Perfect remedy for sore throat.. Mom makes it often! sore throat is not a lot of fun its just uncomfortable and difficult to swallow. I added a dash of cinnamon, it was delish.